Wow that is some title isn’t it? Last week I wrote an article about retrogaming with Linux. In that article I highlighted how to play native Linux games downloaded from GOG.com and how to play Windows games using WINE. The retrogaming article also looked at how to set up games controllers so that they aren’t so sensitive on older games. time I am going to look at playing some classic DOS games using DOSbox. DOSBox should be available for most distributions. 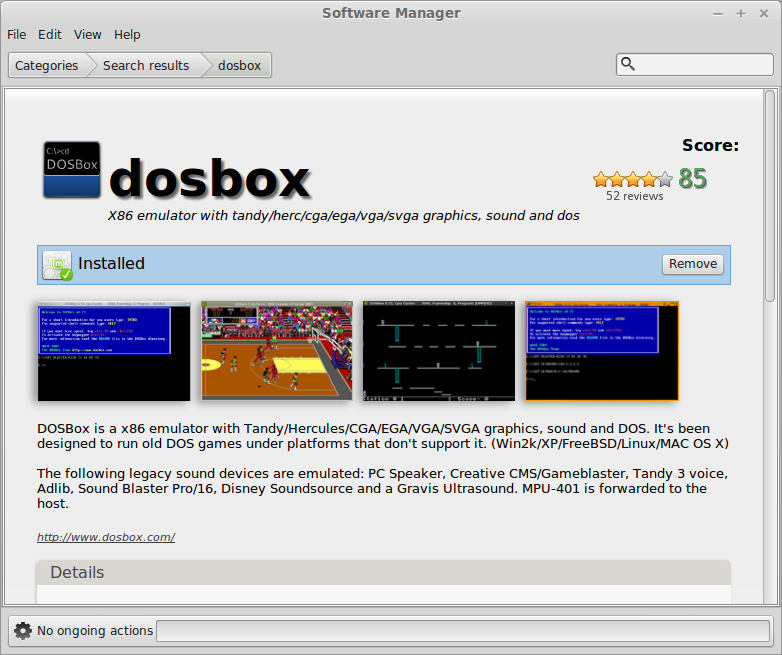 If you are using Ubuntu, MINT or an equivalent then you will be able to install DOSbox from the software centre/software manager. For other distributions you can use the equivalent graphical package manager or one of the command line tools such as apt, zypper or yum. Before you start to worry about playing games you should set up a folder structure on your computer which will be loaded as a drive into dosbox. Now from the home folder press CTRL and H to show hidden folders. Note that there should be a folder called .dosbox. Open the .dosbox folder. There is a file called dosbox.conf (there will be a version number, i.e. 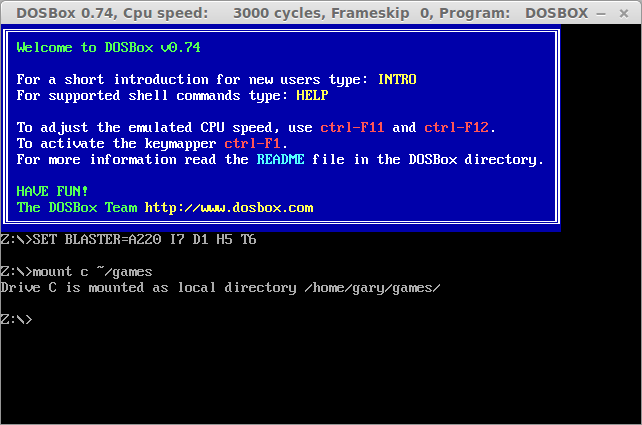 dosbox-0.74.conf). Open the dosbox.conf file in a text editor. The file contains all the settings that you might need such as being able to choose between windowed and full screen mode. The bit that we are interested in though is at the bottom and is titled [autoexec]. There are a number of websites available where you can legally download free games. To get Sim City 2000 click on the link above. If you would prefer another game then do a search on that site or browse the listings. To find your games type c: and press return and then type dir to get a directory listing. Now navigate into the folder of your choice. For example in the image above I have put Sim City into SC2000. 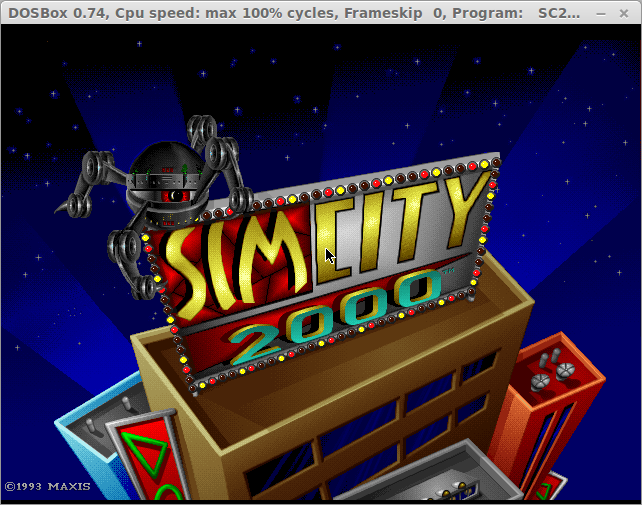 The file to run for Sim City 2000 is sc2000.exe. Type sc2000.exe and press return. You may be wondering why I am releasing this article at the same time that I released another article showing how to play DOS games using PlayOnLinux. I have been messing around with different ways to do things like this all week including trying different dosbox graphical user interfaces. I had written 90% of this article prior to the PlayOnLinux article but I knew there would be an easier way than opening a DOS window and navigating via the command line. This article is therefore being released to show how to use DOSbox but I would recommend the PlayOnLinux method. 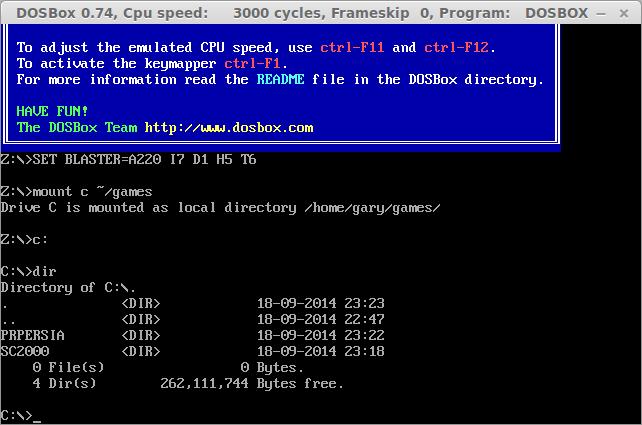 This is the best and easiest guide to DOSbox. Thanks!